Control surface flutter on throttle up while sitting on the table! I have just finished building my first foamie, and have installed all new electronics (except for receiver) only to have severe weirdness happen while throttling up. First of all let me tell you what I am working with. Futaba 6ch. FM, PCM, PPM Transmitter. So basically I have everything hooked up and mounted securely in or on the plane, I have programmed the ESC and fully balance charged the battery. Transmitter on, battery plugged in, everything okay. Once the ESC is armed and I start to throttle up, all the control surfaces start to jitter, BADLY. This happens somewhere between 25% and 40% throttle. Most the time I just throttle down and it stops only to start again when I throttle back up, but sometimes I lose control all together, the motor develops a mind of it's own revving up and down, eventually coming to a stop along with the control surfaces allowing no input at all from the transmitter until I disconnect and reconnect the battery and it starts all over again. I have tried swapping out servos, receiver and battery but nothing seems to work. All the servos are mounted securely, there is no play in the linkages, the antennae is pretty well isolated from everything else. I just don't know what else to try, I've even ordered and installed new crystals in the TX and RX both, but didn't make any difference. Please help, it's such a cute little plane and I've spent so much time and effort building it, I would really hate to end up waffle stomping it into the driveway! But that's about where I am at with it. Scotty have you tried another radio and receiver? Is the radio battery holding a charge? BTW, welcome to Wattflyer! Thanks for the welcome. I have tried 3 different receivers, unfortunately I only have 1 transmitter, and yes the transmitter battery is fine, never drops below 10Volts. I have a feeling the 10A ESC may not be enough ..... it probably has a 1A bec as well. The indicator to me is the motor and gear stopping. Do you have a Wattmeter ? Its your friend in electric flying. FM radios were quite susceptible to RF interference generated from the motor and ESC. To stop RF being sent down the throttle wire from the ESC to the receiver all ESCs used to have a ferrite choke ring . 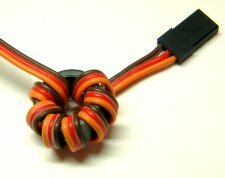 I'd suggest you check to see if the ESC has a ferrite ring fitted on the throttle wire, if it doesn't install one.. or better yet get a 2.4GHz radio system.. they can be had very cheap. I wondered about that, and have tried disconnecting the two Ail. servos but this didn't solve the issue. I have included a graph from the manufacturer that "CLAIMS" it will handle my 4 little servos. I do not have a Watt meter, but I think it will be my next purchase. The ferrite ring idea is something that I never would have thought of. Radio Shack, here I come! p.s. I know that a 2.4GHz. radio system is in my future, just hard to drop the cash right now. Besides, my current system, although about 12 yrs. old, was unused for 11 of those yrs. as I was taking a break from the hobby, so it's more or less new. Darn technology advancements anyway!!! I hope the ferrite ring does the trick, I think it will. Please report back on how it goes. Well, I attached a ferrite....tube? Not really a ring but a hollow cylinder. Anyway, didn't solve my problem, MIGHT have improved the issue I can't really be sure. 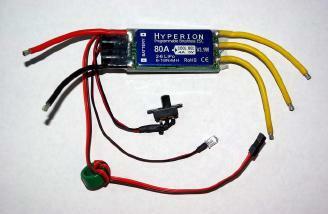 I think I am going to try a larger ESC but the next size up that I own is a 30Amp. Can you tell me why "they" recommend not going more than 3 times your motors max amp draw for a speed controller? I mean, if my 30Amp solves the problem, why can't I use it permanently? The cylinder type wont work with only a single pass, you would have to loop the wire around a few times, but the hole in the cylinders is not usually big enough for that, hence why the rings are normally used. I still think it's most likely that is the issue. You can use as big an ESC as you like, the only downside is the size and weight.. Weight can be a real problem when talking about small lightweight planes. I removed the plug from the end of the ESCs receiver lead and was able to loop it through the ferrite cylinder 4 times (passed thru center 4 times, actually only see 3 loops on outside) so that should do it. I am going to try my 30Amp ESC but it has 3.5mm connectors and my itty bitty motor only has 2mm connectors, so I will either have to run to the hobby shop which only has the 2mm in a two pack for $4.79 of which I would have to buy 2 of or ebay has 20 sets for $4.27 and free shipping. I am going to run into a weight issue if I am not careful, the ferrite added 8.7 grams (but I can find a smaller one) and the 30Amp ESC is 15 grams heavier than the 10Amp. That puts total weight of my plane in the 193 gram range. The original build article claims a finished weight of 4 to 5 ounces, mine with the mods and extremely amateur construction (it was my first foamie, squeegee off excess hot glue WHAT? ) is sitting at 6.8 ounces. I think I'll be okay, the motor has 130 grams of thrust at 5000 rpms, so it should fly. It's not like I am 3D capable anyway. First things first...the twitchies! I'll get some plugs and let you know how it turns out. I really appreciate your suggestions thus far. The other thing that you have probably got covered already is to route the receiver antenna well clear of the ESC and motor. Also having the Tx too close to the receiver can also cause glitching on FM systems. Location: Too close to Chicago. Ferrite Ring was my first inclination but never having flown FM, I remained silent. If only I didn't have a habit of simply crushing them to remove them from ESC leads, I may have been able to help. Guess I should save my next ones intact for possible future uses. Not everybody thinks this is an admirable quality but I never throw anything away. So I was able to come up with a ferrite item. Tape for control surface hinges??? Quick Reply: Control surface flutter on throttle up while sitting on the table!